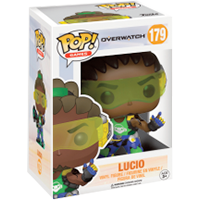 Almost exactly a year since the release of the first series of Overwatch POP! - we’re back with a second series. The Overwatch figures have been sensational sellers, and have continued to sell in HUGE quantity all year long, so you know fans will be desperate to add these new characters to their collections. Fight for the future in Overwatch, Blizzard Entertainment’s upcoming team-based shooter featuring a vibrant cast of soldiers,scientists, adventurers, and oddities! The Symmetra POP! vinyl figure stands around 9cm tall..